Ugh, you guys. 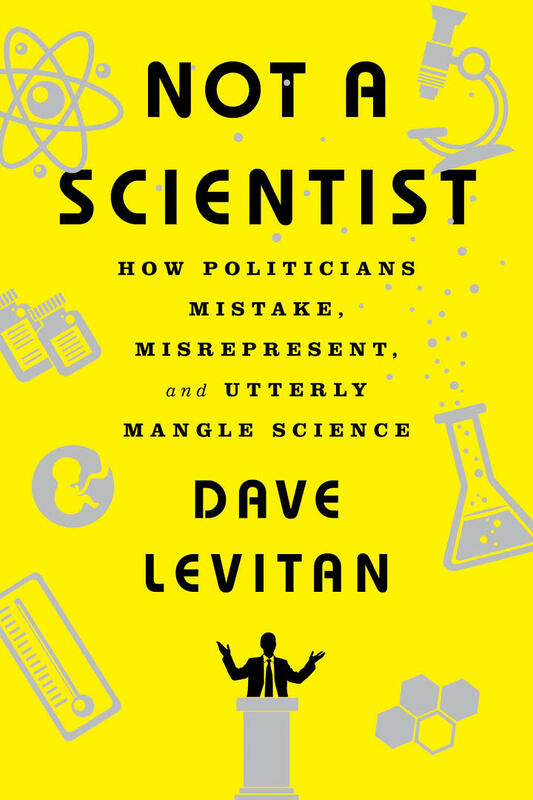 When I picked up Dave Levitan's Not A Scientist: How Politicians Mistake, Misrepresent, and Utterly Mangle Science three weeks ago, I didn't expect it to be so ridiculously relevant by the time I read it. I sat here last night until 3 a.m. and read the entire 200 page book, filling it with post-its and scoffing out loud. 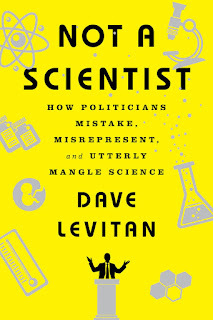 This is a must read for anyone struggling to understand exactly how politicians manage to convince their constituents to ignore real science, regularly prefacing their stupidity with the "I'm not a scientist, but ..." line. Levitan purposely does not go into "why" because motive is near impossible to assign. He doesn't needs to discover motives though because what matters is that, let's be real, today's GOP politicians are presenting lies, half-truths, and misrepresentations of science to further their political agendas and they are harming our nation in countless ways. This book is short and, because Levitan is a journalist, it reads like a nice, long article, very clear and easy to read. It assigns each tactic a chapter, twelve in all (with names like THE OVERSIMPLIFICATION, THE CHERRY-PICK, and THE BLIND EYE TO FOLLOWUP), that expose clear examples of each infraction and provide quick methods on how to spot them. It gives examples of politicians opposed to climate change action, wetlands preservation, and timely vaccines, just to name a few. It also shows how politicians use fake science to do things like further their anti-immigrant agendas or defund essential government programs. Levitan also includes 30+ pages of sources at the end in case you want to double check anything. All of your favorite science-denying idiots are in here -- Inhofe, Cruz, Paul, Bush (all three) -- and he even throws in a couple of Obamas to show how even a well-intentioned bad statistic can be harmful to a political cause. The only one that isn't included in the book is Trump because the book was completed before last November. The Foreword does acknowledge Trump's main tactic though, which he dubs "THE FIREHOSE", basically blasting us with an endless stream of utter crap so that we can't possibly notice/reply to it all. Yay. Vigilance is the only antidote against a flood of misinformation, deception, and backwardness. If you spot any particularly egregious misuses of science from the President or any other politicians, call your senator or House representative--let them know that you want Washington to curtail its anti-science ways. You don't have to be a scientist to notice when the "science" a politician uses seem fishy or incomplete. Though answers aren't always easy to come by on the internet, there are always actual scientists and experts out there to point you in the direction of the correct data/interpretations/studies. Let's stop letting politicians and constituents get away with being willfully ignorant of science. Regardless of what some believe, the only way to attain a safe, healthy nation and world is through the proper application of scientific research. Excellent! Not lecturey at all, madam! 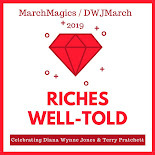 This sounds like a wonderful book and I'm absolutely going to have to check it out. I've seen criticism that this book preaches to the choir but I would argue that we need to know exactly what we're facing, what the rhetoric tools of the opposition are, to be able to fight them, right? It's mind-boggling. I think there must be some really awful science teachers (and religious figures) out there to make adults actually disbelieve and distrust science. I shall add this one to my list! Have you heard of the book Weapons of Math Destruction? I have it on my shelf to read from the library, though I am not sure when I will get to it. I think you might enjoy that one, too! I haven't heard of it but I'll definitely go look it up right now.